ESL teaching methods have come a long way in the past 60 years. Before the 1950s, the emphasis, at least in the United States, was placed entirely on reading ability and not at all on communicative ability. This was mostly because the American people at that time had little opportunity or reason to communicate with people of different language backgrounds. It was not until the U.S. entered World War II that the government realized how vital oral and aural abilities were in foreign language education, and it was out of this realization that many of the ESL teaching methods used today were born. The language instruction before the 1950s was a rather tedious and soporific enterprise that relied heavily on drills, repetition and translation. This very boring-sounding method of language teaching is referred to now as the Classical Method. It is also known as the Grammar Translation Method because it teaches grammar as a means to translate text from one language to the other. If you've ever studied a dead language (like Latin), you've probably experienced this style of language class. Grammar Translation classes are taught in the students' native language, and they require students to memorize long lists of vocabulary and grammar rules, and to translate classical texts and other arbitrary sentences. The Direct Method, developed by Maximilian Berlitz around the 1880s, is based on the premise that a second language should be learned more like the first language. It uses a slow build-up of skills paired with a lot of vocabulary repetition in context to help students learn to communicate from the beginning. The Direct Method uses only the target language for instruction and builds up an arsenal of everyday vocabulary and sentences quickly without teaching grammar explicitly. The teacher teaches vocabulary through pictures, objects and elaborate pantomime. The students figure out the grammar as they go, partially through imitation and partially by trial and error. The Direct Method was not popular in the United States during its European heyday in the first half of the 20th century due to the fact that it requires the teacher to be a native speaker of the target language (which is still much easier to find and employ in Europe today). Also, the U.S. government simply found foreign language conversational skills overrated, convinced at the time that reading/writing proficiency would be far more useful in a place so far from where other languages were spoken. With the outbreak of World War II, the U.S. found itself all over the map, no longer linguistically isolated as it had previously been. It was like a modern day Tower of Babel, and the need arose for military personnel to be able to communicate with both their allies and their enemies. With Uncle Sam footing the bill, structural linguists, teaching methodologists and behavioristic psychologists collaborated for the first time to produce the Army Specialized Training Program (ASTP), also known as the Army Method and later on, the Audiolingual Method (ALM). The ALM teaches grammatical structure patterns and vocabulary through the repetition and memorization of set phrases or dialogues. Once students have mastered a dialogue, the teacher introduces new vocabulary, which the students will then substitute for another word in the dialogue. The words for airport, park and bank can be taught and plugged into the sentence in place of "station." A comparison might then be made between "take me" and "she took me," so students could then correctly say, "She took me to the bank." In this way, students learn the building blocks they need to say just about anything. Following the relative success of the ALM, researchers began to look more deeply into the structure of language itself and into the psychological factors that go along with language learning success and failure. The teaching methods that developed out of this research hinged largely on making the students feel less anxious about the whole ordeal of learning a new language. Gone were the days of drilling. Language classes of the '70s were all about comfort. Total Physical Response (TPR) involves the teacher giving more and more complex orders to the students, who then respond with an action. The students then get to order each other and the teacher around for speaking practice. Suggestopedia is a pretty run-of-the-mill language class, only the majority of the activities take place with Baroque music playing in the background. The idea is that the music will relax the mind so that it can retain more material. Community Language Learning is sort of like group therapy. Everyone sits in a circle to have a conversation, and the "counselor" (teacher) assists the "clients" (students) by "mediating." In the beginning, this means that the teacher translates whatever the students wish to say, and then the students repeat their message in the target language. Gradually, the students need the teacher less and less for mediation and can converse fluently on their own. The Silent Way is a method in which the teacher is very hands-off, providing only props, charts and minimal spoken information and then backing off to allow the students to work together to solve language problems. The Natural Approach is based on the idea that language learning takes place when what students hear or read is comprehensible but just beyond their production abilities. They're encouraged to enjoy a "silent period" until they're ready to begin producing language on their own, and the focus is on basic, everyday, interpersonal situations like shopping, ordering in a restaurant, leaving a phone message, etc. There are pros and cons to all of these methods, and most ESL teachers today employ bits and pieces of each to suit their teaching style and their students' needs. "ESL Teaching Methods." YourDictionary, n.d. Web. 21 April 2019. 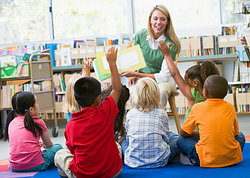 <https://esl.yourdictionary.com/lesson-plans/esl-teaching-methods.html>.